All couples disagree occasionally. When you are in the midst of a disagreement with your husband, the temptation to raise your voice and say damaging things may overwhelm you. This type of behavior may only escalate the argument and hurt feelings. Your husband will not quickly forget the hurtful words that you used. 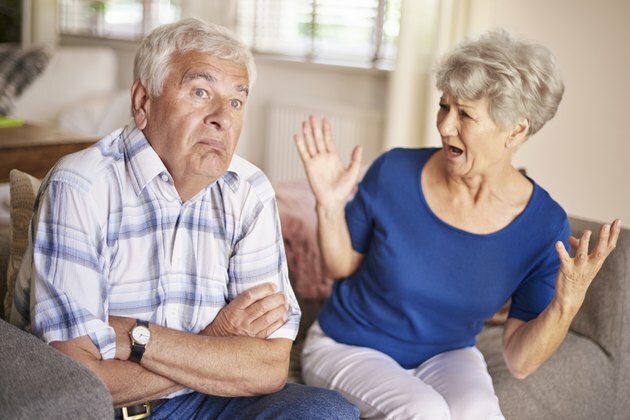 Your marriage can benefit from healthy disagreements, which are an exchange of opposing ideas without hurtful words, raised voices or other unfair fighting techniques. Learn to "fight fair" with your spouse without resorting to yelling. Put off your disagreement until another time if you are feeling angry or tired, suggests the University of Arkansas. If you are in the mood to pick a fight or if you are feeling especially defensive, explain to your husband that you will not have the discussion right now. Agree to talk about the topic later when you are both in a better mood. Stay on topic. Keep in mind what your disagreement is about and do not bring up more volatile subjects. Sixwise.com describes how a simple argument can turn into a screaming match when one person changes the subject to something that the couple has argued about before, but has nothing to do with the current disagreement. Focus on what is bothering you right now. Remain aware of your own stress signals. If you feel your heart starting to pound, your palms starting to sweat and your blood pressure rising, take a break. Take a few deep breaths and calm yourself down before you resort to yelling. If necessary, leave the room for a while until you can discuss the issue calmly. Use "I" statements to describe your feelings. Say something like, "I feel worried when you spend a lot of money without letting me know first. I am afraid that we may not be able to pay the bills or we may bounce a check," instead of "You always overspend and never tell me about it until it's too late!" The first statement relays your feelings to your husband, while the second one puts him on the defense and places all of the blame on him. Lighten up. If tensions are rising, use a bit of humor or playfulness to help both of you relax. Don't be afraid to be the first one to back down in an argument, even if you are sure that you are right. The goal is not to win at all costs; it is to find common ground, share your feelings, and come to a conclusion that is acceptable to both of you. Pick your battles, recommends the University of Arkansas. You will not be able to change some things about your husband and that's okay. Try not to argue over trivial things. If he consistently throws his socks next to the hamper instead of in the hamper, for example, make the decision to scoop them up while you are gathering the dirty laundry instead of starting an argument over it. Why Do Young Teens Fall in Love?